Top seed Eric Lui 7d is one game away from winning the AGA Pro Qualification Tournament’s round robin section, with a 5-1 score and and just one more round to play before the knock-out section begins. 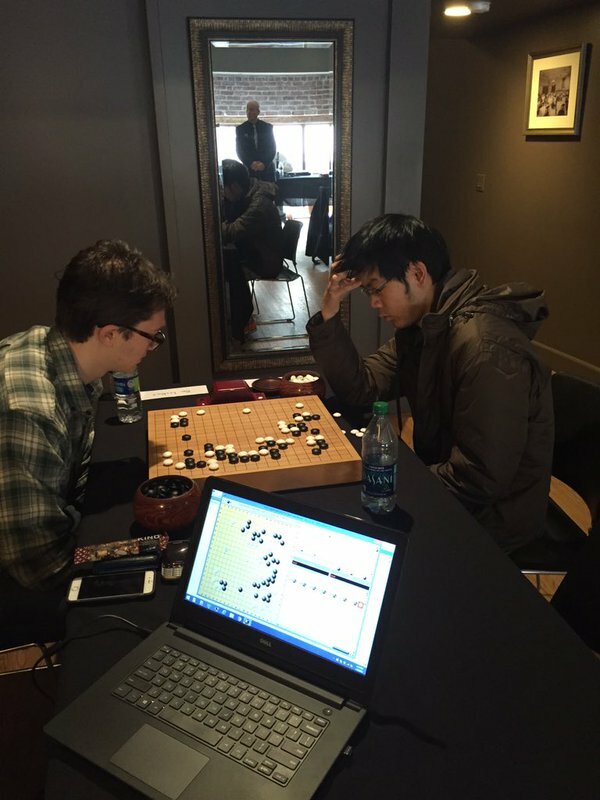 Third-seeded Aaron Ye 7d is in second place, also with five wins, and Andrew Lu and Daniel Gourdeau are next with three wins each. 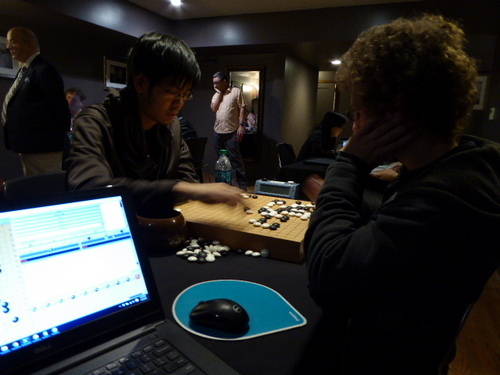 Second-seeded Ben Lockhart has scored just two wins thus far, as have Jeremy Chiu, Sarah Yu and Manuel Velasco. The knock-out section begins Wednesday afternoon; it’s a best-of-three match in which the first game was played in the round robin. All the games are being broadcast live each day on KGS, starting at 9:30a PST and 3p PST. 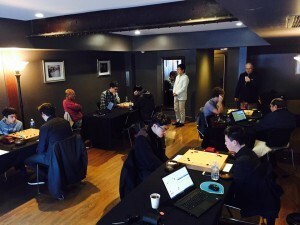 The tournament is being held in Los Angeles at the Hotel Normandie. Click here for the tourney crosstab with results and game records. Brief game highlight videos are posted on the AGA’s YouTube channel. AGA Pro Qualifier coverage continues all week, with game broadcasts beginning at 9:30a PST and 3P PST daily, along with continuous posts on Facebook and Twitter, plus game highlights on YouTube. And if a fifth game is needed in the MLily Cup, we’ll broadcast that as well; stay tuned for complete details. As you may be aware, the AGA website has been down for the last couple of days, due to a DDOS attack on the datacenter that hosts our site. While this issue has hopefully been resolved, we strongly urge you to follow us on Facebook and Twitter, where we’ll be continuing to cover the ongoing AGA Pro Qualifier Tournament live in Los Angeles, CA. Games are being broadcast on KGS starting at 9:30a and 3p PST daily. Your Move/Readers Write: North Americans, not just U.S.
Quite right, thanks for the correction. 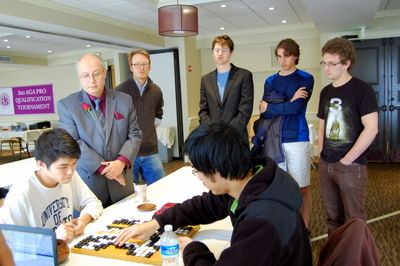 Canada will be represented by Daniel Gourdeau, Manuel Velasco, and Jin (Sarah) Yu. Gourdeau is a returning contender, but for Velasco and Yu it will be their first attempt. Eight top US go players will gather in Los Angeles next week to determine the next US professional. Play in the 4th AGA Pro Qualification starts on Sunday, January 3 and ends on January 9. The games will be broadcast live on KGS from the Hotel Normandie by the E-Journal; morning rounds will begin at 9:30 AM and afternoon rounds will begin at 4:30 PM. The players are Eric Lui 7d, Ben Lockhart 7d, Aaron Ye 7d, Jeremy Chiu 6d, Sarah Yu 6d, Andrew Lu 7d, Daniel Gourdeau 6d and Manuel Velasco 5d. The tournament will be played in two parts, a Round Robin Prelim Sunday through Wednesday, followed by the Championship Thursday and Friday. 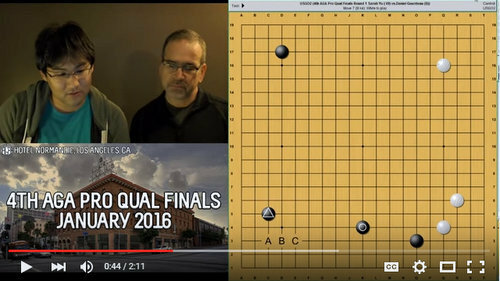 Myungwan Kim 9P is the tournment referee, Jeff Shaevel is the Tournament Director, AGA President Andy Okun will be on hand and Chris Garlock and Dennis Wheeler will head up the EJ recording team, which will also broadcast game commentaries on the AGA’s YouTube stream. The players in last week’s AGA Pro Qualification Tournament were of course the stars of the event – click here for the final results and game records — but there was an entire team of volunteers who made it possible for the tournament to happen and for it to be broadcast around the world. AGA President Andy Okun coordinated with local Boston-area organizers including David Kahn of the Massachusetts Go Association to put on the event at the Nantasket Beach Resort. TD Jeff Shaevel not only devised the tournament’s format, which proved popular with players and viewers alike, but made sure the event ran smoothly and on time. 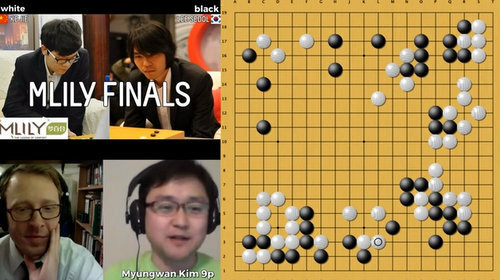 Myungwan Kim 9P worked with Okun and Shaevel and also provided live game commentary on KGS. The E-Journal team included game recorders Andrew Jackson, William Luff, Daniel Steinbrook, Andrew Hall and Brian Lee, as well as AGA president Andy Okun and former Korean insei Mark Lee, who generously pitched in to help out. 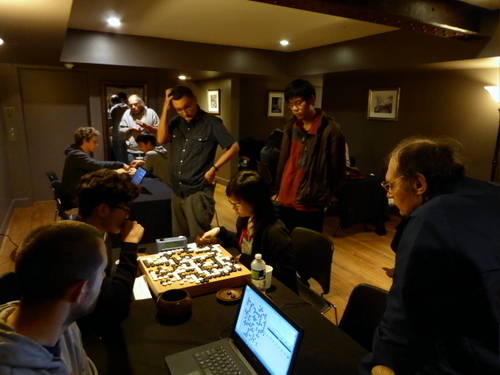 Akane Negishi and her team of KGS admins helped bring the games to the world, and Dennis Wheeler and Steve Colburn kept the results page updated, including posting each round’s game records. In addition to coordinating the recording team, E-Journal Managing Editor Chris Garlock took his turn at game recording and provided comprehensive daily coverage, including updates on Facebook, Twitter and the AGA’s website. Volunteers are needed at a number of such events around the country during the course of the year; if you’d like to be considered, email journal@usgo.org. Your Move/Readers Write: Where are the AGA Pro Game Records? To see the games on the tournament results page, just click on the underlined result (e.g. 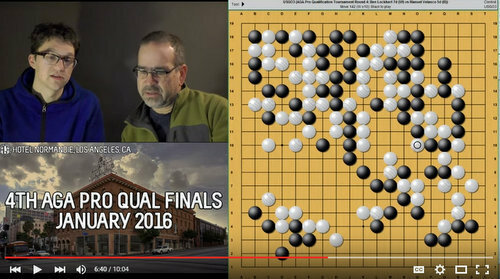 “B+7.5” under Eric Lui) and an sgf viewer will open up with the game record.